Registration is now open! Head over here and log in to your account to register. Summer fun with amazing live music, friends, and incredible dancing! We create an environment of freedom to enjoy each other’s company and incredible jazz. Join with us, no matter how long you’ve been dancing! 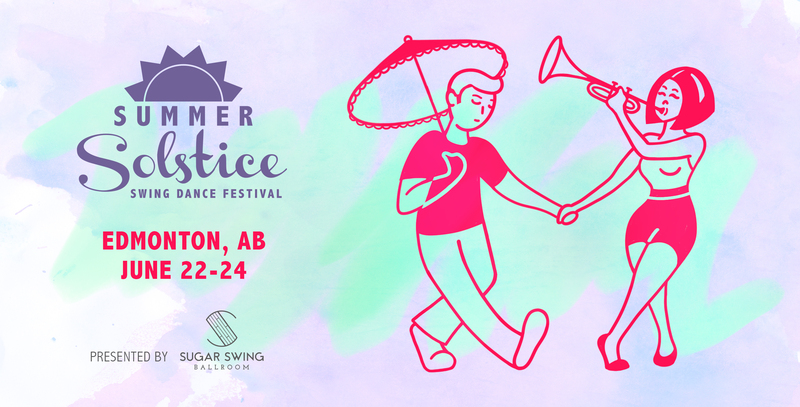 Summer Solstice is hosted at the new Sugar Swing Ballroom, which has AC, sprung hardwood floors, a perfect ambience, and lots of dance space. Summer Solstice, now in its 6th year, holds quite the reputation of being a favourite event among both new experienced lindy hoppers. Highlights for this year? We are hand picking both out-of-town and local marquee swing musicians, along with local bands. As a sneak peak, we are delighted to announce guarist Josh Roberts is coming! This year will have more focus on daytime activities, “strolling the ave” as we say. IN THE WORKS: live jazz outdoors at the Whyte Ave Gazebo! Coffee tour! Brewery/brew-pub tour! Nature walk & trolley rides! Window shopping in Old Strathcona! It will be the perfect platform for hanging out with old friends, and making new ones. Last but not least, we are actually REDUCING the price to make it easier and more affordable for everyone to join us! We want to see everyone participate, especially students and out of town guests! Begins Friday, April 6 at 10:00am! * Students and Members get $5 off! * Out of Town guests receive $5 off! * After June 1, any major changes are uncommon. * Itinerary details may change throughout! Features: Thursday dance, Friday and Saturday night dances with live music both nights, late-nights till 5 am, outdoor dance and live music BBQ, Sunday afternoon cabaret and dance, Whyte Ave cafe and gelato crawl, River Valley Tour, Monday picnic and dance, hot tub, late-night food. Jazz music panel, yoga class, afterparty, air conditioning! Features: Thursday dance, Friday and Saturday night dances with live music both nights, Sunday evening video deejay dance, late-nights till 5 am, outdoor dance and live music BBQ, Sunday afternoon cabaret and dance, Whyte Ave cafe and gelato crawl, hot tub, late-night food. Jazz music panel, yoga class, silly swimsuit contest, afterparty, air conditioning!